Elizabeth Jimenez is #BulldogSTRONG through her commitment to SERVING others on campus and in the community. What Makes Her #BulldogSTRONG: Elizabeth Jimenez is the embodiment of SERVICE as a student at Golden Valley High School. As Secretary of the school's Police Activities League (PAL), Jimenez has volunteered over 230 hours of community service and many nights and weekends at various places throughout Kern County including Camp Hamilton, The Blessing Corner, CALM, Kern County Fairgrounds, and many, many more. 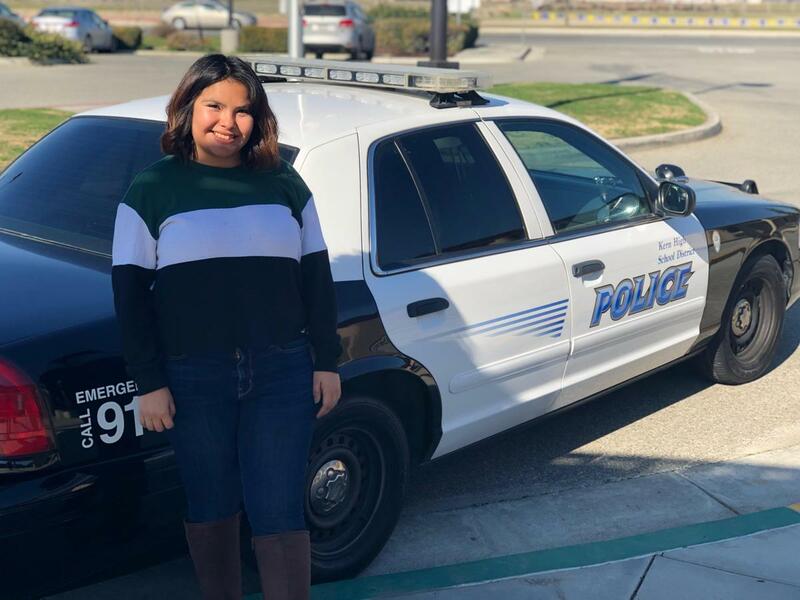 Moreover, Jimenez has given her time to participate in events that benefit the elderly such as Alzheimer Walks and providing Christmas cheer to senior citizens throughout Kern County. In addition to serving the elderly, Jimenez has dedicated a lot of time to SERVING the homeless of Kern County. At the Blessing Corner, Jimenez has cooked meals and organized community feeds in order to help the less fortunate. In addition, at a Back to School event for the Blessing Corner, Jimenez helped provide students school supplies and haircuts to be ready for the year. Jimenez has also been instrumental in the creation of the NAMI Club (she serves as the president) at Golden Valley's campus which aims to bring awareness and support for individuals impacted by mental illness. In addition to her SERVICE as secretary of PAL and president of the NAMI Club, Jimenez is also one of the editors and sports photographers for the yearbook. Jimenez can be seen at a majority of our sporting events (both home and away) snapping photos in order to create lasting memories for the students at Golden Valley. What #BulldogSTRONG Means to Elizabeth: "Being #BulldogSTRONG means taking PRIDE in being at Golden Valley and being part of what happens on campus. It also means that we have to SERVE and help people feel safe and comfortable on campus. Finally, it means GROWING with other students to become better people that give back." "Liz Jiminez has distinguished herself in many ways a member of the KHSD Golden Valley Police Activities League. She has accomplished over 200 hours of Community Service for various activities on campus and throughout Kern County. She is also our GVHS PAL secretary and is tasked with logging our individual and group Community Service hours (currently over 9000 hours as a group). I am proud and pleased with Liz for many reasons including how well she consistently represents our school and PAL Organization. She is #BulldogSTRONG." - Officer Money, Police Department, Golden Valley High School.